In San Diego County, wildfires are a major hazard for our communities. High temperatures can combine with gusting seasonal Santa Ana winds and drought to increase that threat, particularly in the summer and fall. San Diego County residents play an important role in emergency response and recovery by ensuring they are Prepared and Aware. Through Prepare San Diego, the American Red Cross of San Diego/Imperial Counties aims to facilitate a cultural shift to increase individual, community and business preparedness. 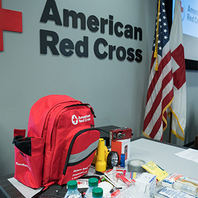 We do that by educating residents on how to prepare for emergencies such as organizing a survival kit, developing an emergency plan and staying connected. Since 1898, American Red Cross of San Diego/Imperial Counties has operated with the mission to prevent and alleviate human suffering in the face of emergencies. In December 2017, the Lilac fire exploded to 500 acres within 20 minutes forcing more than 10,000 residents to evacuate in San Diego. In response, and through the mobilization of volunteers, we were able to establish four Red Cross shelters for residents in need of a safe place to stay, meals, and health services. We distributed emergency supplies and assisted 266 people with their recovery needs. Several alert, warning and notification systems are available in San Diego County. AlertSanDiego is a regional alert and warning system used by emergency responders to send emergency telephone notifications to residents and businesses via land line or registered cell phone. The system can also reach registered residents through email and text. In order to receive an AlertSanDiego call on your cell phone, your number must be registered with the system. During emergencies: evacuation areas, road closures, shelter locations and other disaster information can be found at: www.sdcountyemergency.com. An Additional source for official news or information is the no-cost County emergency mobile application, SD Emergency which can be downloaded on any Apple or Android device. Also, 2-1-1 can be called from any telephone. Representatives are available with the latest information about evacuation areas and shelters. To register a phone or find more information about safeguarding your home from wildfires and general disaster preparation, please visit the Office of Emergency Services’ website at www.readysandiego.org. Together, we can create a region that is resilient to disasters and emergencies when both residents and emergency organizations are prepared to respond. Read more about partners who are working to help San Diego County residents be healthy, safe and thriving by being Prepared and Aware in this month’s Live Well San Diego newsletter.